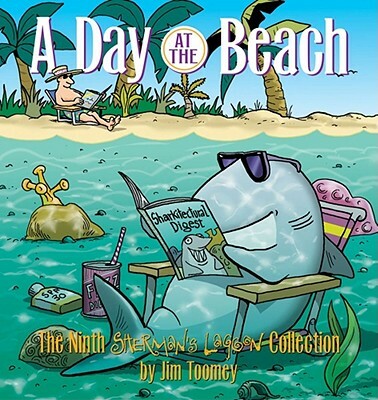 Sherman the dim-witted shark and his cast of characters in Sherman's Lagoon provide enough laughs for a barrel of monkeys, not that they've ever seen any. The Lagoonies, as they're known to regular comic strip readers, are a motley crew-mostly of sea life-known for their acerbic humor. There's Megan, Sherman's wife (a soft-touch despite the tough exterior). Fillmore the sea turtle makes up for Sherman's lack of intellect. Hawthorne the hermit crab resides in a beer can and is always in a "crabby" mood. Ernest the fish is a computer whiz, and Thornton the polar bear stumbled upon the island while floating by on an iceberg. Captain Quigley is the only human (or "beach ape") who resides in Sherman's Lagoon. He lost his leg to Sherman and is now out for revenge, but never quite gets close enough. To round out the cast there's Bob the bottom dweller. Enough said. Sherman's Lagoon has been in syndication since 1991, currently by King Features, and boasts a circulation of more than 200 daily newspapers on five continents.